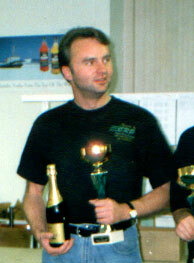 Mario Schöne, as the second non american, won the US Nats held at Port Jeff during the weekend. New U.S. Nats champion. Mario Schöne. (Archive image). The race was the closest, or one of the closest since the early 80:s.
The difference between the first four was only 28 laps. On such a Super Speedway as Port Jeff, this is equivalent to 60 seconds. If, for example, Beuford hadn't over- or underglued, (there is different views on this if you ask driver/pit-crew on which it was) on Black he would have been within 10 laps from Mario in the end. An even closer race! 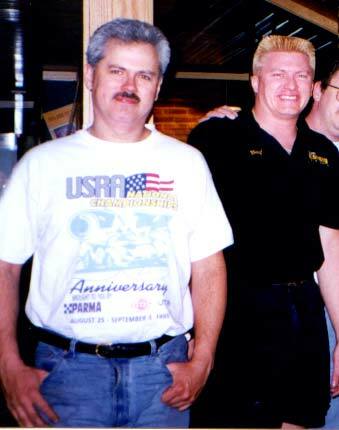 Second in the race was Koford's Mike Swiss close followed my Parma's Paul Ciccarello and Paul, "Beuf" Pedersen. 2:nd placed Mike Swiss to the right and 4:th place Beuf. 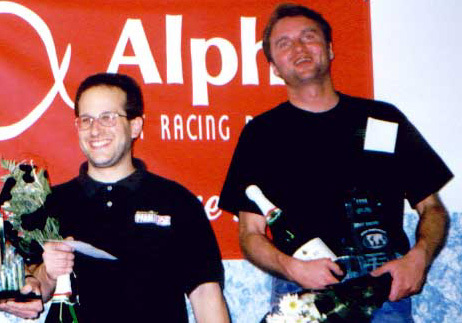 3:rd place Paul Ciccarello, left and the winner, Mario Schöne, to the right.